Crews are encouraged to participate in the sessions below. 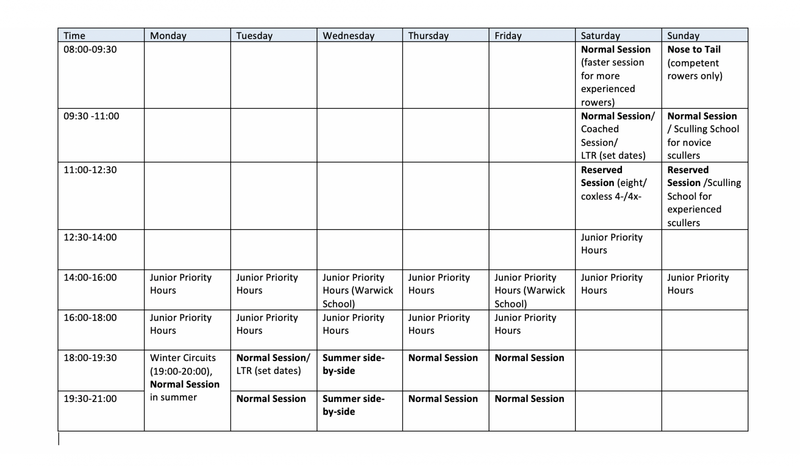 For most organised sessions (for example Saturday mornings at 9:30am) there is a coach on hand to help coordinate and provide some coaching. For all other sessions, the expectation is for crews to organise themselves for a mutually convenient time and arrange their own coxes and coaches. For further support, please contact your squad coordinator. Crews and individuals are also encouraged to use the facilities outside the ‘organised’ sessions, according to experience and conditions - safety always comes first!